The UNDG Study explores the rationale for tracking recommendations and their follow up, and highlights the early experiences of a number of countries, including in the development of tracking tools. 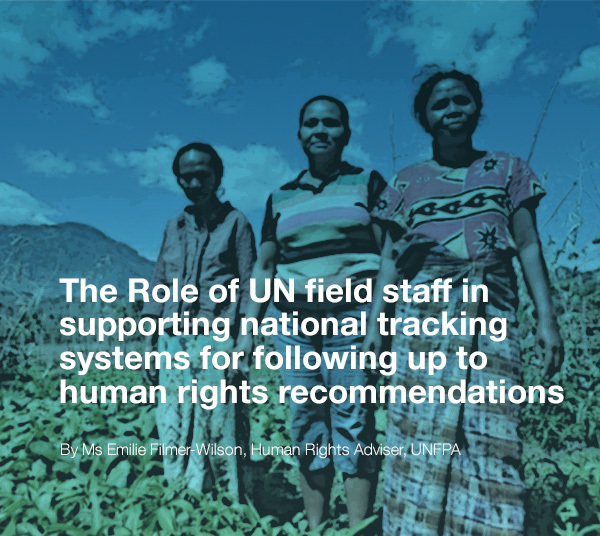 It focuses on the specific role of UN field staff in supporting these initiatives and sets out guiding principles for ensuring that national tracking systems are sustainable, effective and in line with human rights principles. In so doing, the Study aims to encourage similar activities among other UN Country Teams, and to strengthen coherence across the UN. The Study is part of a wider effort by the UNDG to enhance the engagement of the UN development system with the international human rights mechanisms; so that human rights standards and the recommendations generated by the mechanisms are leveraged to strengthen development programming and policies. This will in turn help ensure stronger normative-operational linkages in the UN’s development work, including as part of the 2030 Development Agenda. Encourage the use of databases: databases can be a useful practical tool to consolidate and track follow up of human rights recommendations. While creating comprehensive tracking systems on human rights recommendations is an important step, it is only one step in wider efforts to ensure effective the follow up of human rights recommendations. The UN development system, working at national level, has a critical role to play in supporting States implement their international human rights obligations and commitments, and thereby promote sustainable development. We hope that this Study will further encourage and inspire UN field staff to engage with international, regional, and national human rights mechanisms to achieve progress with development and human rights. Emilie Filmer-Wilson is a Human Rights Advisor at the United Nations Population Fund (UNFPA). The United Nations Development Group (UNDG) unites the 32 UN funds, programmes, specialised agencies, departments, and offices that play a role in development. Feature photo: Three women working in a field in the Memo village (Timor-Leste). 27 July 2012. UN Women/Betsy Davis Cosme, licensed CC BY-NC-ND 2.0.